some quick but convoluted words about singapura. 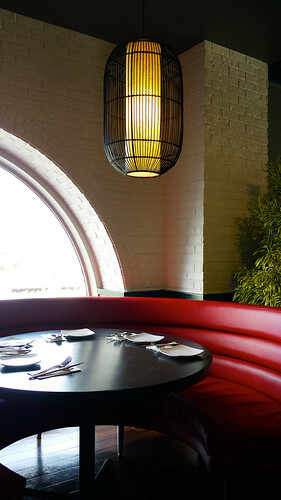 i love malaysian food, so i was excited that singapura, a restaurant that features the food of singapore, had opened. singaporean cuisine embraces the ethnic diversity of the country; the food is influenced by the native malay, chinese, indian, indonesian and even western traditions. singapura is in the royal orchid hotel, in a space that used to hold tony roma's; some white paint, banquettes recovered in red vinyl, and a few well chosen accessories have brightened the room considerably, and created a welcoming atmosphere. it certainly doesn't look like a rib joint anymore. now here is the explanation for the title of this post: the flavours on the menu were described to me by one of the managers as singaporean recipes as realized by a japanese chef, taught to a filipino (?) chef, and tweaked for local tastes. SO. um. yeah. YMMV when it comes to what you consider authentic. 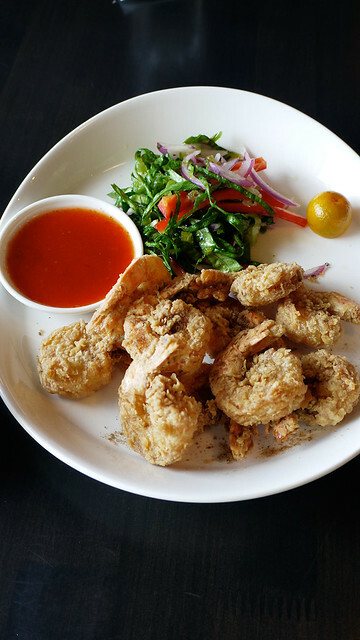 certainly there's a lot of fusion going on, with a mango fried chicken salad and five-spice fried shrimp appetizer, but there are traditional dishes as hainanese chicken, laksa and beef rendang. 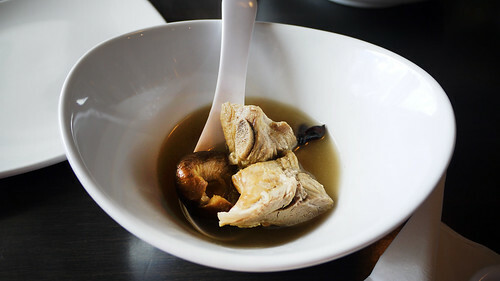 my favourite of the traditional is bat kut teh, which translates to "meat bone tea". a typical version has pork ribs simmered in a broth of various herbs and spices including garlic, cinnamon, clove and star anise; singapura's version is subtle compared to some versions i've tried, but the spices are evident in the soup, and there is an ample amount of tender ribs and fat mushroom in a portion. i haven't tried much on the menu, which is considerable--there are several curries, a few vegetable and grilled items and variety of seafood dishes presented as mix-and-match options: choose from crab, crab claws, prawns, scallops or lobster, and pair it with a chili sauce, or black pepper sauce, garlic butter, or coconut curry. all of them sound enticing. i quite like the crab beehon: rice noodles in an unctious sauce with a crab broth base, wok-fried with crab claws, sweet peppers, bean sprouts, and topped with fried onions. 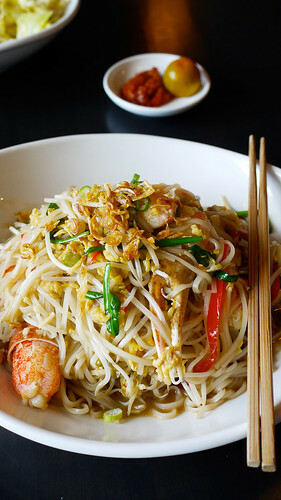 i am not a fan of beehon noodles, nor cooked peppers and bean sprouts, but i sort of love this--it's slightly sweet, savoury, slippery and slightly crunchy, and rich with the flavour of crab. 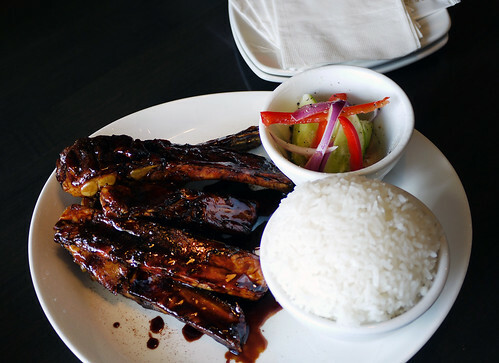 another current fave is the coffee-glazed ribs: braised pork ribs glazed in a mixture of oyster sauce, chinese rice wine, sweet soy sauce, and coffee, then dusted with a bit of cinnamon. the flavour is deep, slightly bitter, and only a little bit sweet, so it's not like drinking pork-flavoured starbucks. well. maybe unsweetened pork-flavoured starbucks. you can watch chef walter cook them here. 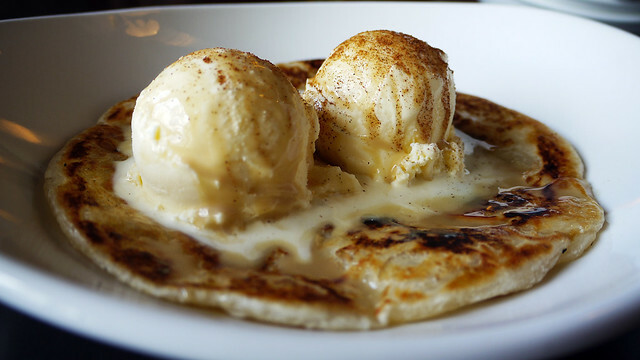 okay, this is probably the least "authentic" dish, but ooh, it's a good one: warm roti prata topped with two scoops of vanilla ice cream, warm coffee glaze and cinnamon. warm, cool, chewy, creamy, coffeeee-ey, and oh-so-tasty. simple and diiiivine. you should check out their facebook page, because there are all sorts of discounts and coupons littering the wall. if you "Like" them right now, there is a coupon for $10 off a $30 bill, which is a GREAT bargain. go. get it, use it. you have a few days (until the end of august). another bargain available is on wednesday nights, something called "tour of singapura" and seems to be an all-you-can-eat for $25 option. i haven't been, i can't quite figure it out, but i think the kitchen brings out a bunch of little dishes, and eat as many of them as you want, then hopefully stop. you can always come back. i don't really like to post anything about a place i haven't frequented much, which probably account for the pitiful amount of content on this blog in the past few years. however, it's always good to change things up, so i'm just gonna experiment a bit and bang out a few "first impression" posts to see how it goes, zokay? 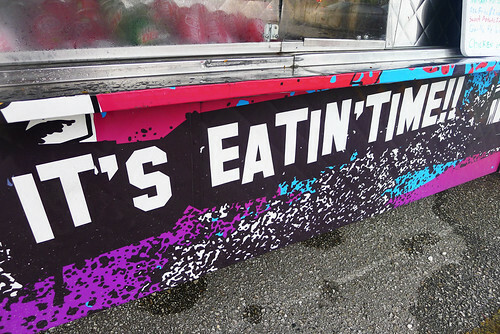 oh, the food truck thing! the first one i remember going to on island was in tumon, a brightly painted red catering truck which featured a yummy yakisoba that was basically fried in butter. i don't remember the name of it--max's?--but it was basically known as the yakiso-van :) when i moved to LA the food trucks i went to were known as roach coaches and didn't have all the gourmet la-la items that are popular now, but still had some tasty mexican food amongst the regular luncheon fare. now when i'm in LA, i tend to avoid the popular "gourmay" wagons--with the exception of lake street creamery and the ludo truck--and stick to the old school taco trucks in my neighbourhood. 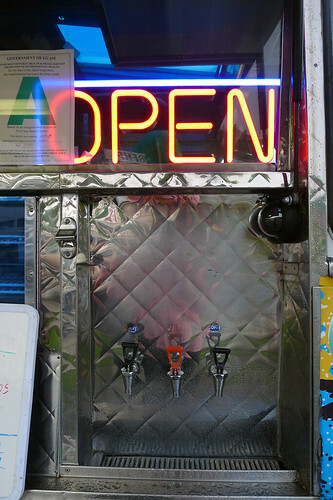 luckily, two great ones are just around the corner, so i can get my fix of LA street-style tacos in mere minutes. 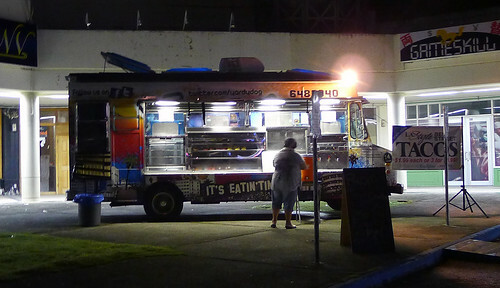 not so much luck here on island, until i was driving around one night a few months ago and saw a couple of food trucks parked in tumon. a little googling led to the yardy's website, and, like any self-respecting, savvy, modern day food truck, a twitter account. from the url, www.yardydog.com, i mistook it for a hot dog truck, but the online menu features mostly hot and cold sandwiches, and a few specialty items. a check on twitter, and i found that yardy's would be at the commercial port in piti during lunch service, skinner plaza in agana in the afternoons, paul's plaza in tamuning in the evenings, and at the fountain plaza in tumon late night. they seem to be sticking to that schedule for now, which makes the truck (i think only one truck is in service at the moment) easy to find. a couple of times i've been to yardy's at the fountain plaza space, near club denial, during their late night hours. 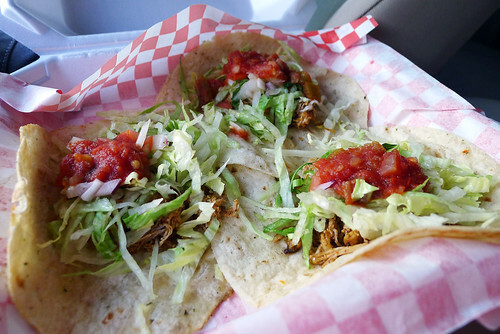 for one reason or another, the menu was limited, so i tried three of their"LA street-style tacos" (one for $1.99, three for $4.99) which were made with soft flour tortillas, lettuce, and pico de gallo on top of your choice of marinated beef, chicken or pork. the beef was prepared differently on the occasions i tried it--the first time it was ground, the second time cut in little cubes--as was the chicken (cubed the first time, shredded the next). 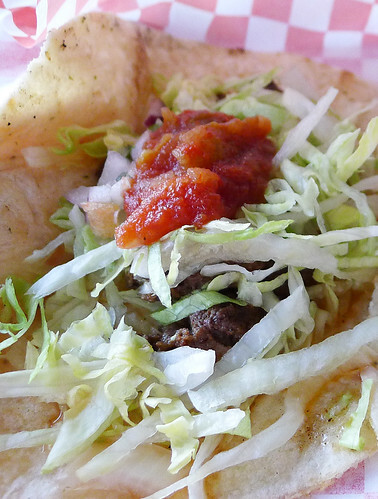 the meat was well-cooked each time, tender and moist; the first time around all three meats were too salty on their own, but combined with the warm tortilla, crispy lettuce and salsa, the seasonings mellowed out and worked well together. these were good tacos, made even better by being freshly cooked, warm and filling on a sloshy, rainy night. i imagine after a night of clubbing and drinking, they'd be a phenomenal way to soak up the liquor and fill up your belly. the next time 'round, i wanted to check out the chicken and waffles. i have had a few very, very late night sessions at roscoe's house of chicken n waffles in LA, but frankly, i remember trying not to get stabbed in the parking lot (only once!) more than how the food tasted (although i remember it being pretty tasty). 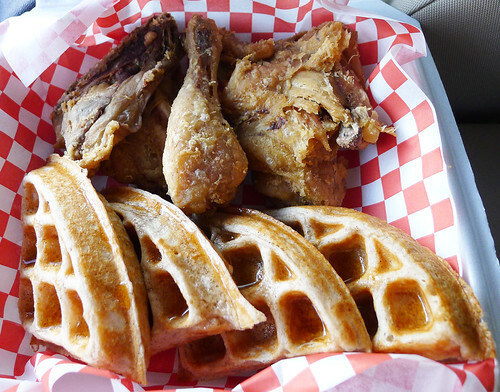 at yardy's, you get three pieces of chicken and a whole belgian waffle per order ($7.50). they are cooked to order, but it didn't take long at all for them to come out. the aroma of the chicken and waffle plate is pretty fantastic--sweet and savoury, warm and slightly spicy, wafting through the air before you actually get your plate. the chicken pieces are a decent size, simply dredged in flour and deep-fried, slightly butterflied to take them off the bone for faster cooking--a smart idea that saves time and didn't seem to compromise the juiciness of the meat. the chicken is perfectly fried--a tender yet firm crunch on the outside, moist, piping hot meat on the inside. it could benefit from a little seasoning--i couldn't even discern any salt--but as far as cooking technique goes, it was great (i am a fan of cold fried chicken, and yardy's chicken holds up well even after a night in the fridge). i appreciate that they used belgian waffles instead of the standard breakfast waffle as the base, as i think the texture works better with the fried chicken. i would prefer to have a little crunch to the exterior of the waffle, but it was warm and tender, with an interesting spiciness i couldn't quite make out--cinnamon? nutmeg? mace?! was it even in the waffle? maybe it was in the light drizzle of sweet syrup on the warm waffle. i still haven't figured out what the enticing aroma was, but it really reminds me of sweet potato fries. (which are pretty great here, btw). just give me a little time, and a few more trips to yardy's. 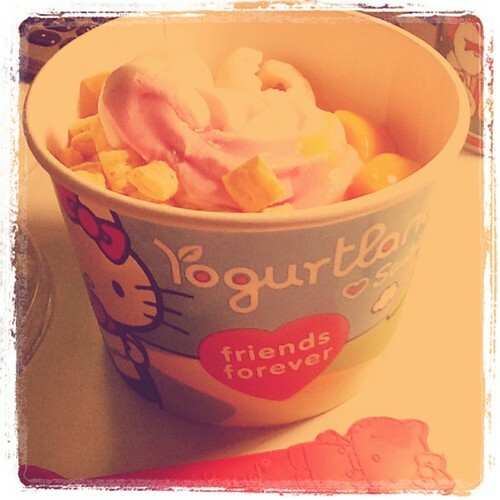 it's hello kitty/sanrio month at yogurtland! sadly, there isn't any cat-flavoured frozen yogurt, nor even a dead-eyed giant hello kitty-garbed employee to loom over you. however, there are appropriately themed cups and four different spoons, and a smattering of merchandise that screams "MOOOOOMMMMMMMMY BUY MEEEEEEE BUY MEEEEEE NOW WHILE I AM ON THIS MASSIVE SUGAR HIGH". (because that's much more interesting than "miaow".) there are sanrio characters bedecking the walls, and helpful flavour-pairing suggestions (chococat swears she loves chocolate yogurt with peanuts, and keroppi likes anchovy yogurt with dead flies plain tart frozen yogurt with gummy worms. because he is a purist.) so for the next four weeks or so, be prepared to battle little and not-s0-little girls in already crowded lines for your next fix of dragonfruit or taro frozen yogurt. not-so-secretly (because i am asian and i am a girl) i love it. i've drunk the kool-aid of the hello kitty pop cultural church. but seriously, this is marketing genius, and yogurtland rocks for that. if they bring back a tokidoki partnership, or do a domo promo, i might have to pledge allegiance to the united state of yogurtland. and to the consumer republic for which it stands. agaña shopping center, next to wendy's. hello nenes! i'm back, and trying to get some holiday posts up for you. in the meantime, i'm going to do some mini-local posts. for those of you craving krispy kreme hot-glazed donuts, crown bakery in barrigada has fresh donuts out of the fryer at rush hour. they are not quite the same as the international chain variety, but they have the ooey, gooey, warm pillowy softness that-u-want, that-u-crave, i know u do. they are available in the morning (7-9 am?) --although the neverending road construction may have put the kibosh on that--but you can definitely get them from 5.30pm every evening. 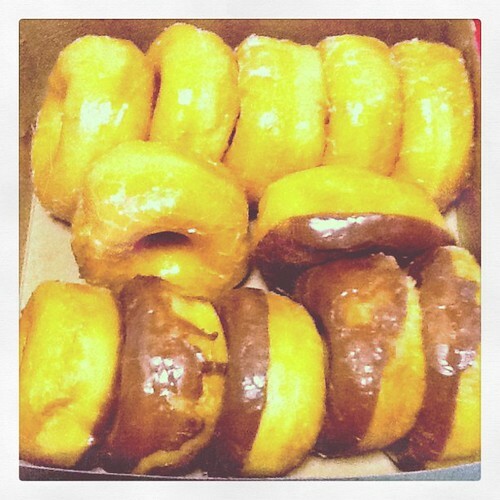 they are available with a plain sugar or chocolate glaze. 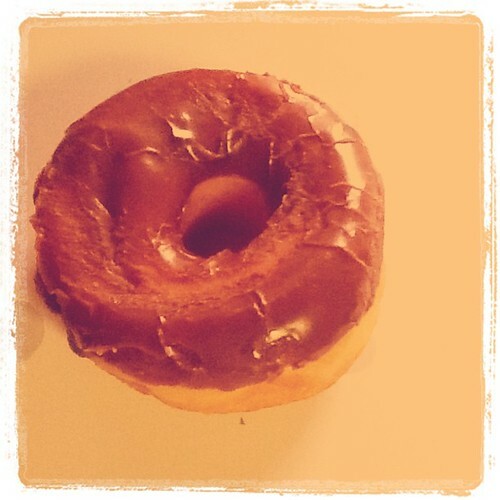 i think celebrity bakery in mangilao also has a hot donut hour, and possibly somewhere else. if you have the skinny on the fat, let me know!